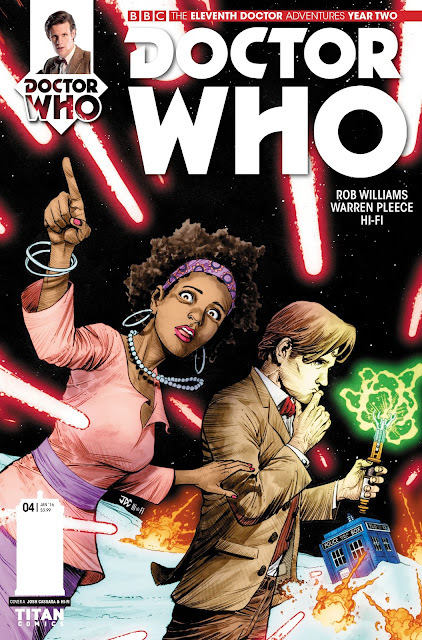 Titan Comics: Doctor Who - THE ELEVENTH DOCTOR #2.4 Review | Warped Factor - Words in the Key of Geek. The Eleventh Doctor comic-books from Titan have never been slow to throw in visuals or references to things that make fans go all high-pitched and unnecessary (if you followed year one of his adventures, you’ll remember the moment when we met the Doctor’s mother, the Cyber-army that believed in a Cyber-God, the return of a pimped-up Bessie and more. Year two has been all high-pitched and unnecessary right from the off, with the introduction of the War Doctor (Oops – spoilers. Screw it, we’re four issues in, get a grip and a move on), and the glorious, chainsword-wielding return of none other than Abslom Daak, Dalek Killer to the universe of Doctor Who. Now, four issues in, the business of the Doctor being on trial for crimes allegedly committed by the War Doctor is getting more in-depth and interesting. The War Doctor’s alleged companion, the squire, has apparently broken out of the Time War to come and find Doctor Eleven, which is all very well except that such a thing is technically impossible (never mind The Day of the Doctor right now, which allowed people both in and out of the Time War). So where has she really come from, and what’s her real aim? The Doctor ends up taking her, along with Alice the library assistant and Daak the demented, to a relic of the Time War, looking for something to confirm or disprove the squire’s story. They find quite a bit there, all told – Alice has a vision, which re-unites us with the War Doctor and the younger version of the squire, seeming to prove her story. Daak, bless his little psychopathic heart, gets to declare chainsword-swinging war on semantics – yes, really, semantics – and Alice, in her innocence, finds a thing that will make any fans of the 80s show go distinctly high-pitched and unnecessary. Certainly when she describes it to the Doctor, it rings positive cloister bells in his head, and sets us up with not only a possible explanation of why he can’t remember the events or the crimes of which he’s accused, and, if he didn’t commit them, possibly who did. It’s a big issue, this one, though in terms of the visuals and the character dynamics there’s not as much to ooh and aah over as there has been in in previous issues of this story. There’s certainly enough to keep the reader reading, and probably to keep them reading at a faster pace than in some of those preceding issues – Daak, besides his trademark leap into violent action, poses a question no-one else in this grouping has the experience to ask: who has killed more Daleks now, Daak or the Doctor? In fact, Daak discovers a camaraderie with the Doctor here that rather sickens the Time Lord. Despite acknowledging that during the ‘X-rated’ portion of his life that was his War Doctor incarnation, he did things he shouldn’t have done (and so on some level acknowledging his similarity with Daak), he still finds a space on the moral high ground from which to tell Alice that Daak is as bad as any of the Daleks. It’s an intriguing double-standard, but perhaps one that only comes with the peculiar life of the Time Lord, different arrangements of yourself, different facets of our personality living your life at different points in your timeline. The Doctor also gets some alone time with the squire to debate the question of how she can be here, the Doctor being suspicious that in his experience, when it comes to finding him in the universe of space-time, his enemies have a much higher success rate than his friends. Meanwhile, Alice is busy finding things that redefine the parameters of the story, and getting attacked by semantics. Beware semantics, they’re appallingly dangerous. And more than a little…scuttly. 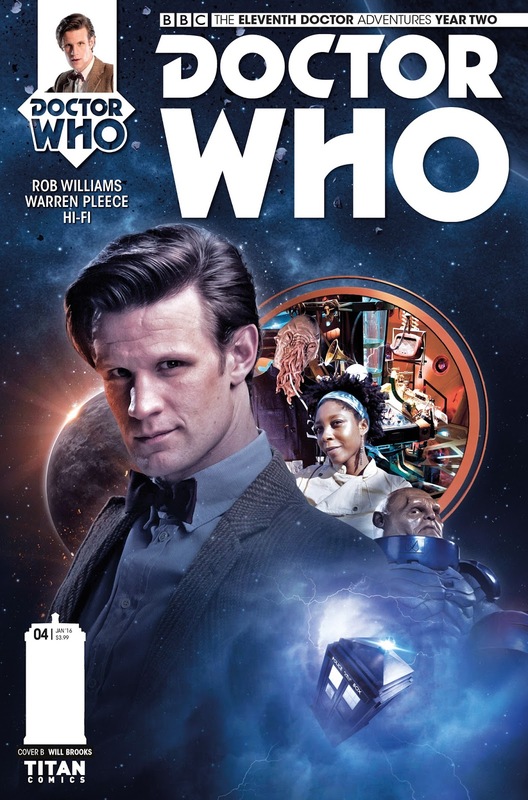 Rob Williams’ story has had, from the outset, the potential to be deeply interesting, probing around in the ashes of the Time War as it affected one species, resurrecting the War Doctor (which secretly seems to be on the Bucket List of most Who writers these days – and indeed, why not? ), introducing a lost companion, and bringing back Abslom Daak. 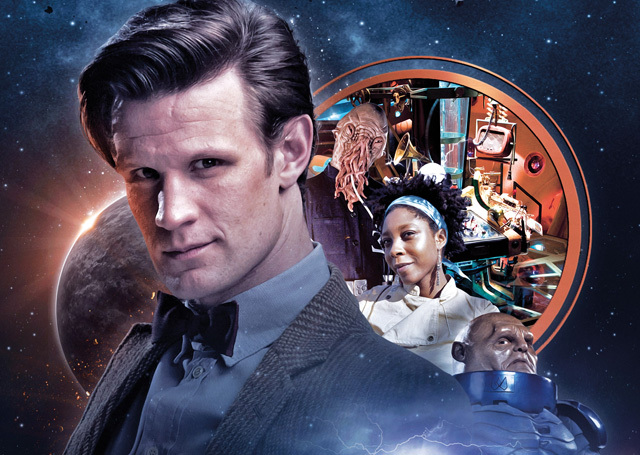 It’s fair to say though that the revelation in this issue could – not will, but could – take the storytelling off in a whole new direction, and one that is massively exciting not least because it will involve the Eleventh Doctor in a confrontation he’s never had before, and has the potential to fill in a missing chunk of on-screen information for us. It most probably won’t do that, but Williams teases us here with the potential of what his story might be about to do, meaning you’ll book your copy of the next issue immediately, because you’ll have to know. The art from Warren Pleece and colour by Hi-Fi and Amoona Saohin are interestingly muted this time around – there are still some solid big panels that you could pick out and pin up as posters (again, Abslom Daak, Semantic Killer is a favourite), but for the most part, there’s a kind of restraint which helps you focus on the pushing forward of the story. That’s certainly the main event in this issue, the story taking precedence over the visuals, and leading us to a potential tease, which is also a potential jumping-off point for a whole new spin on the tale. Go now and grease the palm of your favourite comic-book supplier. You’re not going to want to miss the next issue for anything.